90Percent Cover – November 2013! I would like to thank 90Percent (Italian Skydiving Magazine) for utilizing one of my XRW photographs for the November WebNews 2013 cover spot. It depicts local Eloy wing-suiter Alex Swindle and myself completing a surf dock over Skydive Arizona. The photo was taken with a GoPro Hero 3 mounted to an extension pole set on time lapse mode (One photo per second). 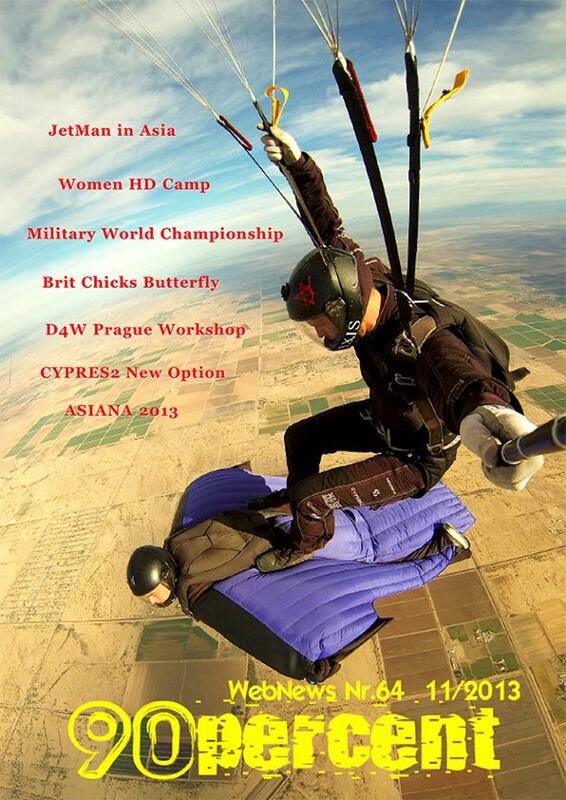 This entry was posted in 90Percent (Italy), Arizona Arsenal, AXIS Flight School, Cover / Featured Photo, Creative, Go Pro, Performance Designs, Photography, Publications, Skydive Arizona, Skydiving, Stunts, Swooping / Canopy Piloting, Time Laps Photography, Training, UPT, Wing-suit, XRW by niklasdaniel. Bookmark the permalink.